Whether you’re looking for a little extra power through the esses or want everyone to know you’re coming through on your Harley, Dennis Kirk has the right Kerker motorcycle exhaust for you. For more than 25 years Kerker exhaust systems and slip-ons have been known for their efficient power, eye-catching style and low-toned rumble. As a member of the SuperTrapp family of products, Kerker was a pioneer of aftermarket performance exhausts, and is committed to helping you squeeze every bit of power out of your motorcycle. With a set of Kerker pipes on your Big Twin, sport bike or metric cruiser, you’ll shoot right to the front of the pack. Kerker full exhaust systems are the choice for generations of motorbikes, using tunable disc technology that helps you find the sweet spot for 10 to 15 additional horsepower. From the Kerker Slash 2-into-2 Unfiltered Exhaust to the Kerker 4-into-1 Race Megaphone Exhaust, each system is designed to maximize flow and minimize weight so you’ll never leave anything on the table. If you want to change the look and sound of your bike without completely changing your existing pipes, check out our quality Kerker exhaust components. Adding a set of Kerker slip-on mufflers will increase exhaust flow while grabbing attention for their flashy finish and deep voice. 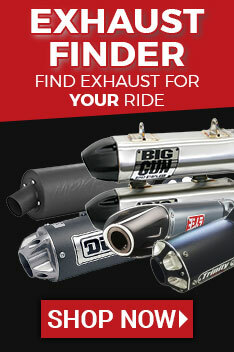 Order mufflers with or without end caps, or pick up exhaust end caps separately for a little extra flair. To get the perfect amount of airflow, use a Kerker baffle specially tailored to your system. Life’s always better with a good set of pipes, and using Kerker motorcycle parts will help your ride hit the right note every time. Use our fitment tool to find the exhaust parts and accessories that match your machine, or contact our Tech Team for expert advice from our support team. We offer the lowest guaranteed prices and ship any order over $89 for free the same-day so you can afford the best aftermarket motorcycle parts. And thanks to no-hassle returns, you can shop with confidence every time.